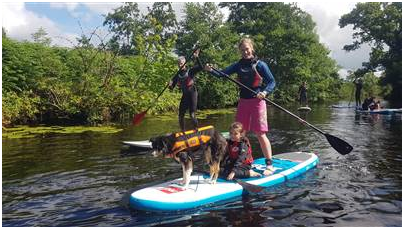 Stand Up Paddle boarding offers you the chance to enjoy the amazing vistas that surround Killaloe from a very different point of perspective. Glide along the gentle waters of Lough Derg, in the fresh air with fun and challenges along the way, all while learning a new sport. Kevin and his team will ensure that you have a fantastic experience. What is included: Wetsuit rental, buoyancy aid, board, paddle and the company of energetic SUP loving hound Luna. This offer is based on 2 nights accommodation with breakfast on both mornings and dinner on one evening of your choice.